A review of literature on the social behaviour of horses is likely to lead many to think equine society is governed solely by the establishment of social hierarchies, usually based on the outcomes of social conflict or competition, commonly referred to as agonistic behaviour. The description of animal societies is mainly based on agonistic classifications, in which cooperation and affiliative behaviour were overshadowed by the competition-aggression-reconciliation paradigm generally emphasized by many writers. Indeed, agonistic and affiliative behaviour are inextricably intertwined (Price & Sloman, 1993) in the complexity of social interactions, making it a laborious task to filter away the units of behaviour neatly into separate compartments for either one type of interaction, or the other. For instance, in the ‘Agonistic ethogram of the equid bachelor band’ published by McDonnell & Haviland (1994), agonistic encounters were considered based on their intensity, running or flowing across a spectrum from “very quiet affiliative behaviour to serious aggression” (McDonnell & Haviland, 1994). In this Equus Ethogram Project, affiliative interactions will be classified separately from agonistic ones, at least when at all possible. A host of authors have extracted units of agonistic behaviours from the interwoven fabric of equine social interactions, so it should be likewise possible to extract those other units of behaviour which promote group cohesion: affiliative behaviours. In horses as in most social mammals, affiliative interactions are usually described by mutual grooming, play and group resting. This ethogram considers including more subtle forms of affiliative behaviour, such as the frequency or duration one individual is found sharing close proximity with others as an indication of their level of bonding (Hinde 1976; Garai 1992; Kleindorfer &Wasser 2004). This population is considered feral, free-ranging and unmanaged, with no supplementary feeding or veterinary care. The park conducts a census every spring to monitor the population. Based on data from the last 12 years, the herd appears to be stable at approximately 175 animals. From 186 horses tallied in 1986, the population grew to about 220 horses in 1990. However, in 1991, 18% of the herd, about 40 horses, died as a result of an outbreak of eastern equine encephalitis. The latest census (2010) accounted for 121 horses. However, it generally considered that a further 50 horses where not accounted for in the 2010 census, and adding these would take the population to about 170 individuals. Cumberland horses live in typical Harem formations and multi-stallion bands (n=37), all female groups (n=2) and a number of bachelor groups (Goodloe 1991). The mares to stallions ratio was 0.6 females:1.0 males (Goodloe 1991; Goodloe et al, 2000). Average multi-stallion band size was 4.6 horses. Up to 32% of the Cumberland Island Population was comprised of Sub-adults. 54% of stallions travelled in bachelor groups (Goodloe 1991; Goodloe et al, 2000)..
Goodloe, R.B., Warren, R.J., Osborn, D.A., and Hall, C. (2000) Population characteristics of feral horses on Cumberland Island and their management implications. The Journal of Wildlife Management, 64: 114-121. Turner, M.G. (1987) Effects of grazing by feral horses, clipping, trampling, and burning on a Georgia salt marsh. Estuaries and Coasts, 10: 54-60. Turner, M.G. (1988) Simulation and management implications of feral horse grazing on Cumberland Island, Georgia. J. Range Manage. 41:441- 447. The importance of sociality to horses, Equus (ferus) caballus, is a topic that can never be emphasized strongly enough, their survival strategies and reproductive successes are highly dependent on the formation of cohesive social bonds (van Dierendonck, 2006 ). In fact, horses should not in my opinion be considered in any other context than a social one. Tremendous effort has gone to describe the “workings” of the horse, how they behave and live, but many fail to see that living in close proximity with a con-specific has been shaped by millions of years of natural selection. Despite millennia of domestication horses that have either been set free or have escaped and allowed to roam on their own accord, have in many parts of the world: thrived by adopting survival and reproductive strategies that are generally quite similar to one another. The fundamental similarities unveiled by years of descriptive studies are a testament to their evolutionary importance. But, similarities do not equate to sameness and differences found in their ways of life are likely to shed light on alternative life strategies, and their incredible biological plasticity which allows them to “fit” into such distinct environments. It may be dead obvious to most that all extinct and extant equids are in fact horses. Equus, the name Linnaeus (1758) used to classify the genus that included the zebras, half-asses, donkeys, Przewalski and caballus, is a Latin name meaning: horse. Throughout this Ethogram, emphasis is on Equus caballus, and use of the colloquial term “horse” is a shorthand referring exclusively to this species. Studies of social behaviour are in fact studies of “(…) cooperation between individuals” (Tinbergen, 1953), and cooperation will be the centerpiece of our approximation to the social life of Equus caballus throughout this present work. Increased foraging efficiency, improved predator detection, avoidance and defense, as well as easier access to reproductive options are three of the more important benefits of group living. At the same time group living is likely to heighten competition for resources, aggression among group members, as well as increase exposure to parasites and disease. (Alexander, 1974) For social behaviour to be adaptive, advantages must outweigh the costs associated with group living (Alexander 1974; Wrangham & Rubenstein 1986). Animals that live together influence each other in a myriad of ways, and serve a number of functions. In horse societies all individuals associate with all other individuals at some rate and any resulting order is related to the ecology of a population, including interactions with con-specifics. Under this heading we have classified behaviours related with taking material through the mouth and into the digestive system. Horses are an herbivorous, grazing species that graze an average of 14-15 hours a day in the wild. Ronald Keiper (1985) found that horses on Assateague island spent 78% of daylight hours grazing. Horses are non-ruminants; they have a single stomach and the digestion of ingested roughage occurs in the cecum at the end of the large intestine. Cecal digestion, high level of food intake, and quick passage of food through the digestive system allows horses to have a diet high in fiber and low in protein. Although horses prefer grasses (McDonnell, 2003), they are known to forage and derive nutrition from bark, tree, shrub buds, small woody stems, aquatic plants, fruits, roots and seeds (Hubbard and Hansen 1976; Varva and Sneva 1978; Salter 1978; Salter and Hudson 1979; Hanley and Hanley 1982; Krysl et al. 1984a). Feral and free ranging horses also pick food from the floor, and have been noted to glean and lick as well. On Assateague Island along the Maryland-Virginia coast Keiper (1985), found that these horses graze during 54.6% of the night time hours. Tyler (1972) in her 3 year study of the New Forest ponies stated; ‘from the few observations that were made at night, it seemed that most of the hours of darkness in all seasons were spent feeding’. From these studies it seems that on the onset of darkness walking and drinking activity becomes greater, especially in the first hours of darkness (Keiper, 1985). Horses rest either standing or lying on the ground, and up to 30% of horse’s time budget can be spent resting. Rest in horses is generally a social and socially facilitated enterprise (see Group Rest), when one horse rests, others group members rest. Typically, in close proximity to other group members (Tyler, 1972; Feist & McCullough, 1976; Kimura, 1998; Sigurjonsdottir, 2003; Heitor et al, 2006), either in tight groups, or alternately, in groups of one or two pairs (Feist & McCullough, 1976). 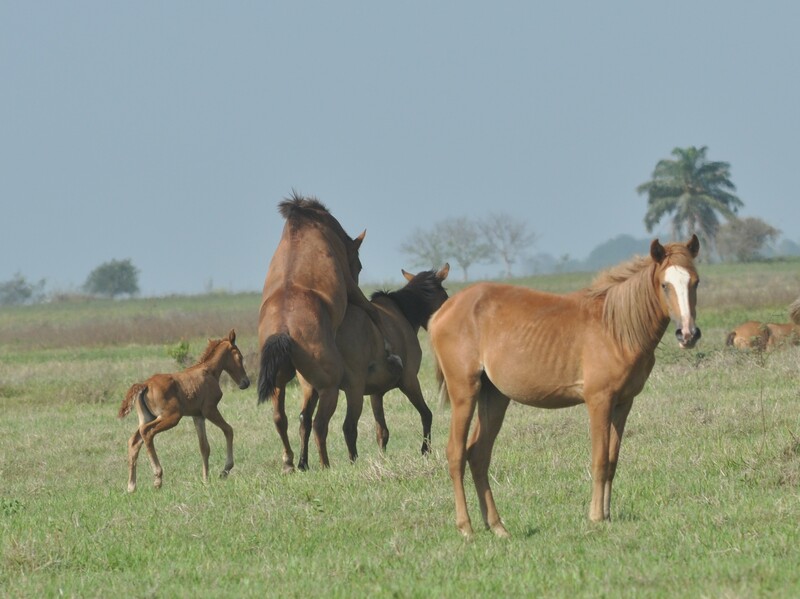 However, foals were observed to rest together even though their mother’s were from different bands (Tyler, 1972). Tyler (1972) observed seasonally different mean resting times in the New Forest ponies in her study. In winter daylight hours, adult ponies were observed to have 2-3 resting bouts lasting a mean length of about 40 minutes. Foals rested a little bit longer, about 44 minutes (Tyler, 1972). In summer, the length of resting bouts increased. Not only did resting bouts increase in duration during the summer months, but New Forest ponies sought shelter in ‘shades’ (Tyler, 1972) for up to 5 hours. Habituation is one of those terms habitually (see I did it again) used in training and experimental protocols. Trouble is, it is so overused and underdefined that its significance has been frayed at the edges, and is used by most as a term that means having gotten used to something. Whether you are training horses, dogs or rats, or working with these in laboratory or field experiments, the importance of habituation is underestimated in most cases. Some proponents define habituation as a waning of response to repeated presentations of a single stimulus, while others would argue that it would only be so if the stimulus was not followed by a second reinforcing or punishing stimulus. It is almost as if depending on your worldview and the justification you need for your methods or protocols, habituation per se would acquire a distinct definition in almost every case. Having said that most definitions are simplistic and vague in that they do not provide enough information for anyone to differentiate habituation from other phenomenon in which a waning of response is sought. Habituation is a widespread occurrence, observed across phyla, from single cell organisms capable of behaviour, to mammals. The strikingly different neural and biochemical circuitry of the animals in which habituation has been described, underlie an elemental and nearly ubiquitous form of biological plasticity , primal for survival and reproductive success in the majority of behaving organisms. This same ubiquitousness however has led many to synonymously use the term instead of others whose underlying common denominator is a waning of response to repeated stimulus presentations such like acclimatization, accomodation, negative adaptation, desensitization, sensory or motor fatigue, extinction, or even inhibition, to name a few. Going back to the passage from “Don’t Shoot the Dog” provided above, a closer look at the explanation of how habituation was apparently attained by exposure to aversive stimuli without possibility of escape, can equally refer to animals in a state of learned helplessness (Pryor, 2002: p.67)as explained in the very same book. Furthermore according to Seligman (1992: p. 9) learned helplessness is “(…) a psychological state that frequently results when events are uncontrollable.” That is to say that if nothing the animal does can help it escape or avoid the aversive stimuli it plunges into learned helplessness. Similar to herdsmen or shepherd dogs herding their flocks of sheep, stallions herd or drive conspecifics controlling their direction and speed, and this is usually referred to as herding or driving behavior (Tyler, 1972; Feist & McCullough, 1976; Lucy Rees, 1986; McDonnell, 2003). Stallions have been observed to adopt a species specific herding posture (Berger, 1986) characterized by lowering their heads, stretching out their necks, pinning back their ears, and moving forward toward the targeted conspecifics. If we breakdown the herding posture to its component parts we would find a conglomerate of behaviors which may be interesting to consider on their own. The pinning in a backward direction of the ears, or Ears Laid Back (McDonnell, 2003), or Ears Retracted (Berger, 1986), is typical of a threat posture or expression (Tyler, 1972) as is the Head Threat (McDonnell, 2003) in which the head is pointed forward with neck extended and it is usually associated with agonistic encounters. The targeted individuals typically responded by moving in the opposite direction from which the stallion was approaching. According to Tyler (1972), ocassionally the stallion would have to gallop in front of the group to ensure that mares did not straggle from the rest of the group in higher intensity movements. The vigour or intensity of this behavior is assumed to correspond to how low the head is dropped and the general speed and gait adopted by the stallion. Not only that but how far ears are pinned in a backward position may also be indicative of intensity. Additionally stallions may move the head from side to side in a snake-like fashion usually referred to as snaking movement, or head tossing (Berger, 1986). So, if a stallion approached with the herding posture at a walk, it was most common that the targeted conspecific/s would respond in a similar pace. Stallions usually approached from the rear pushing the individuals forward, but they also approach from slightly to one side in order to direct movement. Feist & McCullough (1976) observed this behavior in their study of the Pryor Mountain feral horses of Montana. From a total of 139 instances wherein stallions were recorded to perfom this behavior, they noted that 42% (n=55) of these corresponded to stallions herding or driving their band away from other bands or stallions, in 30% (n=39) stallions where guiding the direction of movement of their bands while on the move, 12% (n=15) of the time stallions singled out a mare for courting, in 12% (n=15) stallions drove non-band members away from theirs, and in the remaining 4% (n=6) stallions herded-in new members. If you are a photographer or happen to have images related to this topic, and wish to share them, please do contact us. We could surely use them, and would appreciate it greatly! This is a work in progress under our ongoing Equus Ethogram Project, further information and suggestions are welcome and will contribute to further updates. Feist, J.D. and D.R. McCullough (1975) Reproduction in feral horses. J. Reprod. Fert., Suppl. 23:13–18. Keiper, R. (1985) The Assateague Ponies. Tidewater Press, Cambridge, MD. McDonnell, S.M. (2003). A practical field guide to horse behavior: The Equine Ethogram. Lanham,US. : The Blood-Horse, Inc.
Tyler, S. .J (1972) The behaviour and social organization of the New Forest ponies. Anim. Behaviour Monographs 5 (2): 85-196.